Have you ever been to the perfect garden party? The music is smooth, people are mingling and boisterous chatter sounds from every corner of the garden. The smell of delicious food wafts through the air and the overall ambiance is cheery and laid back. The conversation is animated and everyone is having a great time. How do you create this atmosphere? How do you make sure that your outdoor space accommodates such gatherings? Hospitality, generosity and great planning are the key factors, closely followed by an awesome setting. The first three can not be designed but the last one can be manipulated through well thought out design. Some of the main considerations are shelter from winds, screening from nosy neighbours and well laid out spaces with easy access between them. The spaces have to create room for all of the guests and the design has to accommodate everyone comfortably. When creating this laid back atmosphere through design, one of the elements that I find really useful are informal benches. These can be straight simple boxes set at a comfortable seating height, often with no back support or L or U shaped structures creating semi-enclosed spaces. The following examples show how this type of seating can impact different spaces. This sunken garden is the perfect place for parties and family gatherings. The spaces are designed so that guests and hosts can sit comfortably in soft garden furniture or perched on informal benches. When mingling the latter may be useful for a quick entrance into a conversation and then a fast exit to move on to the next group. The bench’s 90° corner along with the facing sheltering wall frame the perfect space for chatter and natter, although in this picture a flower pot or two may have to be moved off the bench before a big gathering. This bench has a concrete base and a hard wood seat. 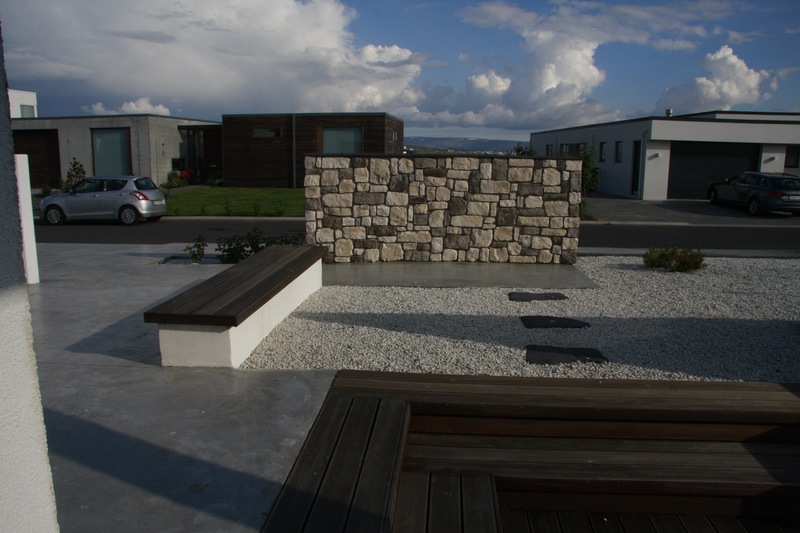 It is part of the front yard of this modern Scandinavian home. It serves the purpose of a design accessory as well as being an informal bench for the home owners and their guests. This design uses modern materials with a complementing colour scheme but contrasting textures. With a mattress the bench can also act as a sun bed. This bench is close to the front door and very popular for the younger generation not wanting to enter the house just yet on a warm summers day. Found in a south facing row house garden this bench does much more than act as informal seating. It defines the space allowing for more functions and diverse use. 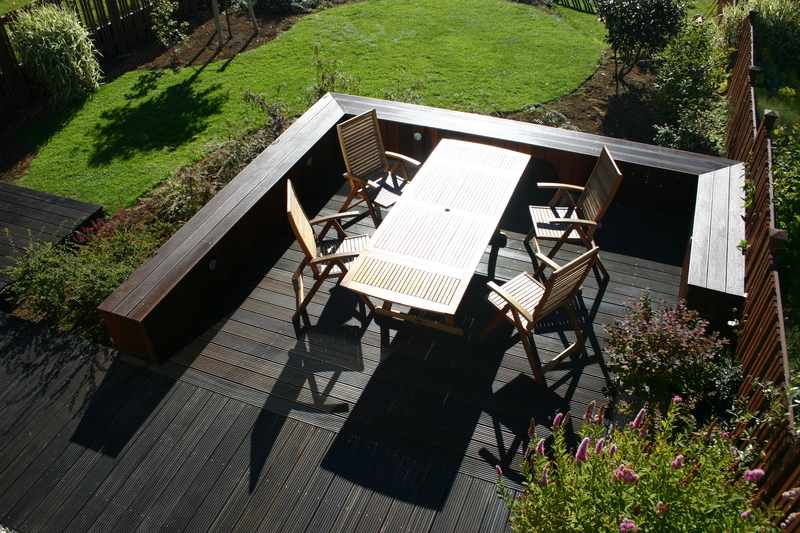 By taking the edge of the space and turning it into a functional sitting area the deck can accommodate more people. In this small space a buffet can be laid out on the table and up to 20 people can gather comfortably for an afternoon cocktail and nibbles. The pictures in this blog post are from just a few of the Urban Beat gardens. 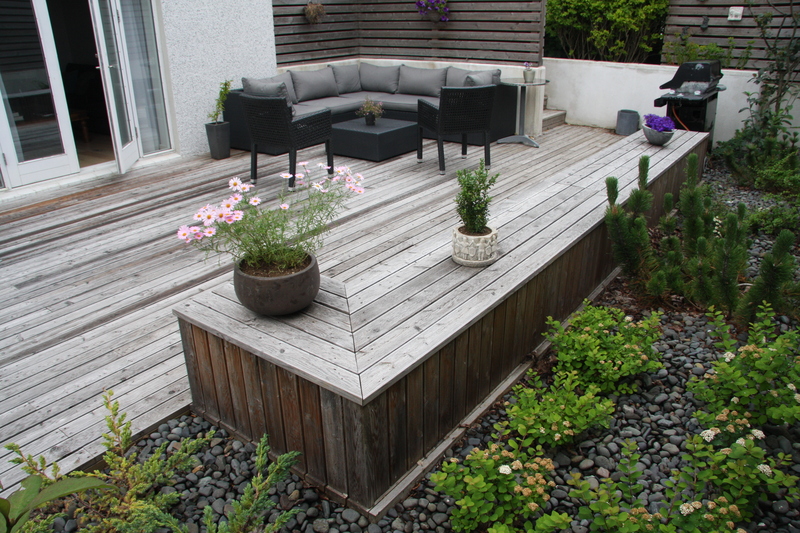 Read one of our earlier posts 8 Scandinavian landscape ideas to learn more about our style. What is an Urban Beat Garden? An Urban Beat garden is a stylish garden with minimalist forms and diverse uses. Based on the Scandinavian design movement the gardens are low on maintenance but high on functionality. An Urban Beat Garden is where you go to sunbathe, barbecue and relax in a hot tub with your favourite beverage in hand. Some of the features are fixed seating, outdoor kitchens, fireplaces, greenhouses and covered areas with heaters in the ceiling. The planting is low maintenance, consisting mainly of shrubs and low trees with an average of 20-25 species per garden. Last, but not least, they complement each building style by echoing the forms and colours of the building they surround. Please leave a comment or visit our facebook page if you are as interested in Scandinavian style gardens.